Believe it or not, having a clambake isn’t all that hard – you can have one in your own backyard if you please. The particular methods I use doesn’t involve having to go to the beach. To add a little spice to my method, I set up a little beach scene complete with an umbrella and beach towels, but you don’t have to do that if you don’t want to. Today, I am here to tell you exactly what to do in order to hold your very own clambake in your backyard – I’m going to start out by giving you a recipe that consists of using a roasting pan – but I’m not overlooking those of you that want the traditional method in your own backyard. This method works great for those individuals that don’t like the idea of digging in their backyard or for whatever reason, aren’t allowed to use a fire pit (some communities restrict fire pits). You can take a roasting pan and prepare the clambake straight on your grill by setting the roasting pan on your grates. This method can be used on either a gas grill or a charcoal grill – both work well. Start out by putting the corn, potatoes, and sausage in the bottom of the pan and get them half cooked before you add your seafood. Start out by preheating your grill. Take a large roasting pan (I recommend one that is at least 18-inches) and add the sausage and potatoes, along with 4 cups of water. Place the roasting pan on the grill and close the lid – bring this to a boil. Once it has started to boil, scatter the lemon rounds, add the clams, thyme and garlic. Cover the roasting pan with aluminum foil and close the grill lid for 15 minutes. After 15 minutes have passed, open it up, stir it and add the corn and shrimp. Cover it up, close the lid and cook it for about 15 minutes (until the clams open up). Transfer the contents to platters or bowls and serve it with melted butter, lemon wedges and Old Bay Seasoning. This method is great for those individuals that are allowed to have a fire pit in their backyard and don’t mind doing a little bit of digging. Yes, this method will consist of some digging (that’s expected with the traditional method), but in the end, it is well worth it, especially if you like the idea of having a traditional clambake without having to go to the beach. If you already have a pit in the ground, you can skip this step. Start out by digging a small pit. It only needs to be about two feet in the ground and five feet wide. Next, line the hole with large stones. Once you have done that, get a wood fire started in the pit. Let the fire burn down to embers, then spread them around. Cover the embers up with a damp cloth of seaweed. Now, it’s time for you to get the food started. What you put in your clambake depends on what you want, but you should have the essentials like the clams, corn, potatoes and sausage. Along with the essentials, I recommend adding lemon halves, some butter and herbs. Layer your ingredients in one of those large aluminum foil pans. Start out by putting the potatoes and corn in the bottom, top that with sausage and seafood, then on the top, add the herbs, lemon and butter. Put on a good pair of oven mitts and place the uncovered pan on top of the seaweed. The idea here is to basically steam the food, and this will take about an hour. You can do this by taking one large canvas tarp and soaking it with water, then placing it over the pit – you can put stones on the edges to keep this tarp in place. You can occasionally sprinkle the tarp with a hose in order to keep it damp. Step Four: When is it Ready? After an hour has passed, lift up the tarp and check on the food. The clams should be open by now. Carefully remove the seafood from the pan and place the lid back on it. Put the tarp back on and let the potatoes and corn cook for an additional 15 minutes – check them frequently. When you’re able to poke a fork into the potatoes that means they’re done and it’s time to eat. A clambake is something that just goes with the summer months, but that doesn’t mean you have to put it to the side during the winter months! This is a tradition that we have the Native Americans to thank for – they started the art of steaming corn, clams, potatoes and other types of food by digging a hole in the ground. 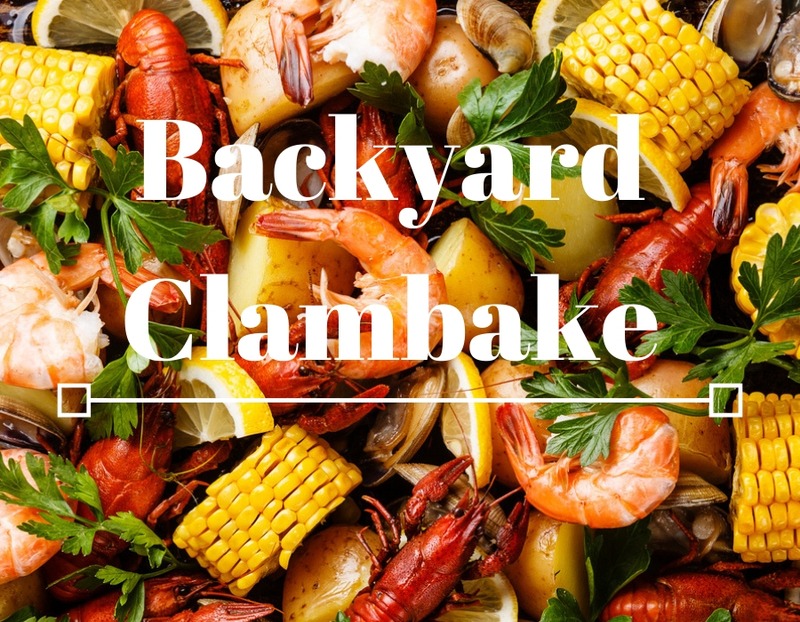 Today, this amazing ancient form of cooking has increased in popularity and now that you know how to do it, you can have your very own clambake in your backyard.